We are a decicated group of parents looking to help support our school. We’ve done some amazing things so far and would like your help to make it even better! Mission: Support the students of the school through focused outreach efforts to parents, the community, and beyond. Where is the Quincy Lunch Menu: here! Where do you drop off the kids? Front of school. Huckins Avenue or a side street. Don’t block driveways. What time is drop off? The bell rings and the door opens at 8:15 am every school day morning regardless of the day of the week. What time is pickup? Pickup at 2:30pm every day except Tuesday. Tuesday pickup is at 11:55 am. Where can you sign up for Squantum School email alerts and news? You can keep up with Squantum in a number of ways Facebook, Twitter, Email. The Squantum School also uses an email list to highlight important events and news. You can sign up on the front page of the site. The motto of the Squantum School is “A Great Place to Start.” I believe that our school is the ideal place for a child to begin his educational journey. The teachers are dedicated to their profession and provide a warm, nurturing environment where each student can reach his maximum social, emotional, physical, and academic development. I believe in a strong PTO to support our school. Please donate your time to this great cause. 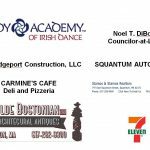 The following local business have generously contributed to the Squantum PTO events organized to raise funds to benefit current and future students of Squantum Elementary School. If your business is interested in sponsoring our school in our upcoming Fun Run contact us at volunteers@squantumpto.com.